In 2004 I started a side business selling small electronic testing units that measure the radon levels inside homes. 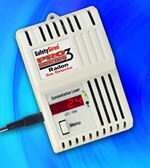 I was surprised at the high levels of radon my customers and friends reported in and around the South Lake Tahoe area. Since most Tahoe home owners and visitors are unaware of the problems associated with radon gas (it causes lung cancer!) I decided to publicize the EPA's research and provide testers that anyone could use to monitor the amount of radon in their home or vacation rental. Radon gas is similar to cigarette smoke in that the damage it causes is dependent on the levels of concentrations and the length of time. The problem is that we know when someone is blowing smoke in our face, but we do not know how much radon we are exposed to on a daily basis without doing some testing. The tester sells for around $100 and is easy to use. Once elevated levels of radon are identified, there are many ways to eliminate the gas from your house. Professional radon mitigators can give you estimates, or you can tackle the job yourself, as I did, and get very good results if you use recommended methods. I wrote up the entire process in the "Do It Yourself" section of my Radon at Tahoe web site. You can order testers there and you may find out more about radon than you ever thought you wanted to know. The site has links to many radon resources, including the excellent EPA radon web site and many other government and commercial sites. If I have my way you have not heard the last about radon!